AutographsForSale.com offers dozens of authentic hand-signed golf autographs on cards, photos, golf balls, magazines, pin flags and other items. This includes autographs from PGA Tour stars past and present including Billy Casper, Fred Couples, Ben Crenshaw, John Daly, Jason Day, Ernie Els, Nick Faldo, Rickie Fowler, Sergio Garcia, Padraig Harrington, Hale Irwin, Hideki Matsuyama, Rory McIlroy, Phil Mickelson, Byron Nelson, Jack Nicklaus, Arnold Palmer, Gary Player, Justin Rose, Adam Scott, Sam Snead, Jordan Spieth, Lee Trevino, Bubba Watson, Tom Watson, Tiger Woods and many more. 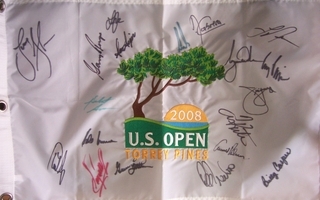 Featured to the right is a 2008 U.S. Open embroidered golf pin flag autographed by 19 winners including Tiger Woods. Every autographed golf ball purchased on AutographsForSale.com comes with a free hard plastic cube display holder.